The best mice are absolutely essential – even if some tablet and laptop manufacturers want you to think that a tap of your finger or a stylus is the best way to interact with your PC. There’s nothing quite like using an awesome mouse to get around your desktop. No matter whether you’re using a PC or a Mac, a trackpad or a touchscreen just isn’t as efficient. The best mice aren’t limited to a tiny space on your laptop chassis – not to mention the sheer precision. Maybe you even have an old mouse lying around. However, picking up one of the best mice will make an older mouse seem like a relic of some bygone age. So, before you head out to pick up the best mouse, there are a couple things you need to think about. Is your current mouse starting to die? Are you thinking about going for a wireless mouse? Or, are you just looking for one of the best gaming mice? Regardless of what you’re looking for, the best mice can make your entire computing experience better. All the best mice on this list are packed with unique features that can only be found in high-end peripherals. So, let’s dive into the best mice 2019 has to offer. Yeah, we know, you saw how much the Logitech MX Master 2S costs and just scoffed – just bear with us a second. The Logitech MX Master 2S is the best mouse 2019 has to offer, especially if you have work to do. While most mice in this price range appeal to gamers with ridiculous button setups and edgy designs, this mouse is created for productivity alone. Trust us, you might not think you need a high-end wireless mouse for your day to day office work, but once you get your hands on this one – you’ll never go back. Smaller than Logitech’s flagship, the MX Master, the Logitech MX Anywhere 2 is the ideal travel mouse. 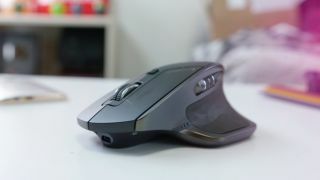 It can connect with up to three distinct devices with 2.4GHZ wireless technology or with Bluetooth, making it obvious why this mouse is renowned for having quick setup and surprisingly long battery life. Capable of extremely quick charging, in just 4 minutes the MX Anywhere 2 charges enough for an entire day. These days, all of our peripherals are either being shoved full of unnecessary lighting or morphed into odd shapes. So, the Microsoft Classic Intellimouse, with its classic design and appealing white lighting, is a breath of fresh air. It also beefs up the sensor, allowing users to ramp up the DPI to 3,200. It’s not wireless, and it’s hardly made for gaming, but if you’re in the market for a mouse that’ll help you get all your work done, the Microsoft Classic Intellimouse may be the best mouse for you. Yeah, this mouse looks weird and its name kind of looks like some annoying tongue twister, but the Anker Vertical Ergonomic Optical mouse is only off putting until you get your hands on it. From the moment you start using this mouse, you’ll know it’s the one of the best mice around. While it’s built a little more cheaply than other ergonomic mice, it’s an affordable way to prevent RSI. When Apple isn’t occupying itself by building luxury smartphones that you can unlock with your face, it was hard at work crafting one of the strangest mice we’ve ever used. If you found yourself doing a double take when reading the specs, you saw right – the Magic Mouse 2 lacks buttons completely. However, it makes up for this apparent oversight with sheer aesthetic appeal. This mouse is completely controlled by gestures, giving it all the benefits of a trackpad as well as a mouse. If you’re looking for an extremely comfortable mouse that will make your work day a little less rigorous, you’ll need an ergonomic-focused mouse. Luckily, the Logitech MX Vertical is a great example of what these mice are capable of. As the name suggests, it’s a vertical mouse, but it feels a lot more natural in your hand and helps reduce the amount of stress you have to exert on your wrist and hand muscles. And, as an added bonus, there’s a handy little button at the top that lets you seamlessly swap between different computers – even further reducing the amount of movement you have to perform. The third trackball mouse Logitech has put out since 2008, the MX Ergo Wireless is an anomaly in an industry that is otherwise crowded with optical laser mice. As such, it’s certain to charm those who haven’t quite moved on to the gesture-based desktop trackpads of the present. With the option to lay it flat or use it at a 20-degree angle, this mouse is uniquely satisfying. This is one of the best mice if you’re looking for something that’s seen and not heard. Because the Logitech M330 Silent Plus is so compact and silent, it’s the perfect mouse for using on an airplane tray next to a sleeping neighbor. Just slip it into your laptop bag when the flight touches down, and weighing less than a quarter of a pound, you won’t even notice the added bulk. It's cheap! It's cheerful! It lasts forever! Sure, the Microsoft Surface Precision Mouse that came out late last year is tempting, but sometimes you just need a cheap, reliable mouse that you can throw in your laptop bag without a care in the world. That’s where the Bluetooth Mobile Mouse 3600 comes in. This may be the best mouse for anyone looking for an inexpensive pointing device that won’t let them down – it’s one of the most reliable wireless mice you can buy today, and it’s from a brand you can trust. Razer products aren’t for everyone. Specifically, they appeal to an audience that enjoys the svelte industrial design of an Apple gadget, but with a gamer-centric slant. That’s especially the case with the DeathAdder Chroma, a mouse that comes with 16.8 million LED-backlit color options out of the box, along with a hyper-accurate 10,000 DPI sensor.